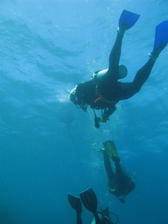 It is with great sadness that we report the death of a 36-year-old diver. The Pierce County Sheriff’s office dive team responded to a 911 call at approximately 2 p.m. on Tuesday April 18, 2017. They were informed that the diver was unresponsive just south of the Navy Surface Warfare Center on Fox Island. Responders attempted CPR on the diver as they took him to the Navy dock where Gig Harbor Fire & Medic One met them. Efforts to revive the man continued as he was transported to Saint Joseph Medical Center in Tacoma, where he was pronounced deceased. According to a Pierce County spokesman, the man was a geoduck diver working on a commercial vessel for the Squaxin Island Tribe. Because the incident happened on a commercial vessel, The U.S. Coast Guard will lead the investigation.